Learn to use social media for your organization at a social media seminar on Thursday, August 13, from noon - 1:30 p.m. at the Bellevue Chamber Office, 302 Bellevue Square. Greg Lins, President of TLG Innovation and Founding Partner of Questus5, will focus on your bottom line and leave you with new ideas that can improve the financial performance of your business using social media. Audience participation will drive the discussion, so be prepared for valuable takeaways. The cost is $25 for Bellevue Chamber of Commerce members and $35 for non-members. Seating is limited, reservations are required. Starting Tuesday, Sept. 8, The Seattle Public Library's Library Equal Access Program (LEAP) will implement some changes to its computer lab usage policy. The LEAP lab is at the Central Library, 1000 Fourth Ave., Level 3. LEAP offers special adaptive equipment, materials in accessible formats and Library services for patrons with special needs who are blind and/or visually impaired, deaf and/or hearing impaired or with other special needs. Beginning Sept. 8, Library customers who want to use the LEAP lab computers will be required to have Library cards from The Seattle Public Library and will need to present their cards or give the card numbers to staff members when signing up to use the computers. Patrons who don't have their cards with them can have staff members can look up their information. Staff members can also assist patrons in applying for new library cards. The time limit for computer use will change from two hours to 90 minutes. There has recently been strong demand for LEAP lab computers. Changing the time limit to 90 minutes will allow more people to use the computers each day and will help prevent long waiting periods. This is the same time limit on other computers throughout The Seattle Public Library system. The transportation-related industry is among the largest of employment sectors. 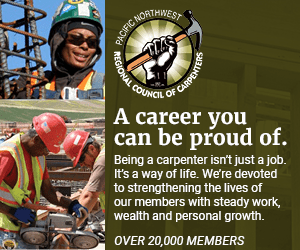 Learn to how to become a part of it from 6 to 7 p.m. on Wednesday, Sept. 9 from 6 – 7 p.m. at S. Seattle Community College Georgetown Campus at the Puget Sound Industrial Excellence Center (PSIEC), 6737 Corson Ave. S., Seattle. Learn about South Seattle Community College's new Transportation, Logistics, and Supply Chain Management program. The short-term, 19-credit program is designed for working adults who want to gain practical and relevant skills to enter the industry, and professionals seeking to enhance their knowledge. The program covers all aspects of the industry, including airport and seaport operations, supply chain management, domestic and international freight operations, and transportation and border security. Introduction to the structure, organization, and operation of a modern airport and seaport, including current issues and challenges. Held Tuesdays from 6 to 9 p.m. Examines the global supply chain with emphasis on supply sources, distribution, production planning, inventory and warehouse management, and supply chain relationships.Held Thursdays from 6 to 9 p.m.
For more information, call (260) 764-5350 or visit www.southseattle.edu.